Online: adjective Available through a computer network; the Internet. Online Quiz: noun A test of knowledge that is available through a computer network or the Internet. Welcome to the Online Quiz section of our Online English Lesson Article Library. We are especially proud of this section because of the high quality level of our quizzes and that this is one of the most thorough Online English Quiz and Answer Libraries on the Internet. Quizzes, also known as Exercises, are an effective and enjoyable way to advance all areas of your English quickly. We recommend taking a corresponding quiz each time you finish a lesson. There are quizzes for every lesson in the library and they are SO helpful. If you have any questions about the quizzes or would like to ask an English teacher help, you can. Visit the Online English Learning Tree, a free Feature within the Online English hub. For the second half of our gigantic collection of Online Quizzes visit the Online English Hub's Quiz area. If you are getting great use out of our quiz library the Teacher Staff would LOVE to hear your happy comments. There are membership options where direct email contact to the Online English Hub's Staff and Cast becomes possible. "Enjoy the quizzes and we hope to hear a 'hello' from you!" hi. thanks for the interesting quizzes. was really helpful. 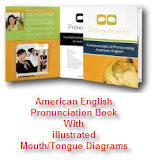 American English Pronunciation: T or D?